Navarrenx is a delightful little bastide town, situated in the beautiful Béarn region. It was awarded prestigious Plus Beau Village status in 2014. Bastides or fortified towns and villages laid out in a grid pattern are to be found all across the South West of France and Navarrenx is a fine example. Navarrenx is one of the oldest cities in the province with the earliest history of the site dating to 1st Century. It is recorded in a medieval manuscript of the eleventh century under the name of ‘Sponda-Navarrensis’ meaning ‘edge of the Navarre’. 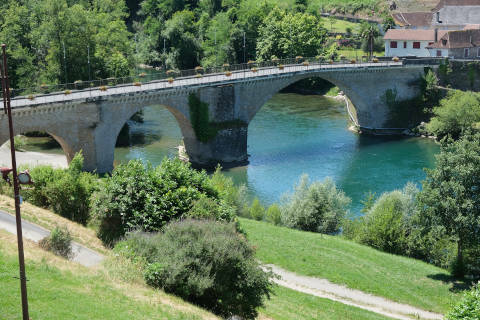 In the 13th century, Gaston VII ordered a stone bridge to be constructed to facilitate crossing of the Gave d'Oloron. The town became heavily fortified in 1538 under Henri II d'Albret, King of Navarre and sovereign of Bearn. Many of the defense mechanisms are still present: the 10 meter high ramparts are classified as an historic monument. Bastions and military buildings within the walls remain today. The fortifications were tried and tested during religious wars under the reign of Jeanne of Albret, when the garrison under the command of the Baron of Arros successfully resisted a three-month siege in 1568. Navarrenx is not only famous as a bastide but has since the Middle Ages been a resting place for pilgrims travelling to Saint Jacques de Compostella (Camino de Santiago). Over 12,000 each year still pass to this day and they are entitled to a ‘Menu Pèlerin’ (a pilgrim’s meal) at the Taverne Saint Jacques. As they pass through the Porte Saint Antoine and cross the bridge only another 543 miles to go! However, you don’t need to be a pilgrim to enjoy a meal here and the Taverne is open for lunch and dinner from Easter until the end of October. There are other bars and restaurants to sample and the pleasant South West climate means that meals, both lunch and dinner, are more often than not enjoyed al fresco throughout most of the year. Navarrenx has held its weekly market on a Wednesday since the 1500’s and through the summer months there is an additional market on a Sunday morning. It is also home to many artisans, potters and painters. Real ale drinkers should be sure to stop off at the Shakespeare Brasserie. This micro-brewery produces English bottle-conditioned real ale, brewed using authentic ingredients. The House of Cigar is housed, together with the Tourist Office, in the Barracks which date back to 1537. Here you will learn all you need to know about the production of a Navarre cigar, a cigar that is 100% Bearnaise. From the ramparts you can admire the Gave d'Oloron which is the longest salmon river in France and has its source high in the Pyrenees. Navarrenx, together with nearby Oloron-Sainte-Marie and Sauveterre-de-Bearn, has hosted the World Salmon Fishing Championships for over 40 years. Navarrenx holds an annual Salmon festival and the splendid figure of a fisherman and his salmon on one of the roundabouts leading into the town, are testaments to its importance. Also for the sports enthusiast there are tennis courts and swimming baths. Close to the centre of town is the Fronton where you may be lucky enough to catch sight of pelote, a sport which is very much associated with the Pays Basque. A new 18 hole golf course, reputedly going to be of a very high standard, is due to open in the summer of 2016 in the grounds of a nearby chateau. A little further afield of course are the magnificent Pyrenees which are home to numerous sports both summer and winter all in the most beautiful of settings. In addition to the more well-known towns such as Oloron-Sainte-Marie and Sauveterre-de-Bearn there are many pretty little villages just waiting to be discovered in the surrounding region.